Shaggy is texture, shiny in appearance, this ultra fine micro fibre range would compliment any décor. This extremely popular collection is made in ten stunning colours, each rug has at least two different coloured yarns. The pile is made from shiny polyester, the backing is made from cotton. 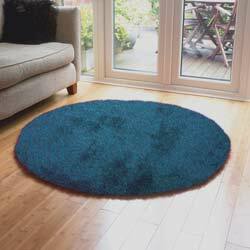 Santa Cruz round rugs offer excellent value for money.